The Web Application Support Services Contract is an agreement used when offering a retainer service for maintaining a web based application. Use this to specify exactly what the client is getting in terms of maintenance, and also to disclaim what you will not do and what you are not responsible for. to your tools, is when a client comments on how unique our proposal or contract document looked to them from the competition, especially when we win the contract." This Web Application Support Services Contract is included in editable Word format that can be customized in Word or by using the included Wizard software. The purpose of this agreement is to reserve Company time on a monthly basis to perform maintenance and other tasks as requested by Customer. Company shall, during the Term (as defined below) provide to Customer the following support and help-desk consulting services described below (the "Services" or "Work Product"), at such times as Customer may reasonably request. Root-cause investigation and analysis, including all diagnostic services undertaken in order to determine the cause of or correction of problems as they are reported. Installing patches, fixes, and updates to operating system and/or servers; installing additional software packages to the operating system or server; and installing patches, fixes, and updates to additional software packages as requested by Customer. Active monitoring of Apache Web Server, MySQL Database server and any additional logging that Company deems necessary in order to help ensure Quality of Service (QOS) for systems being monitored. Developing policies and procedures for updating, maintaining and preserving systems, practices, methods or other documentation and knowledge transfer. Evaluating and making recommendations to Customer regarding web site, security, protections, or any other concerns Company or Customer may have in order to help maintain stability of Customer's Web Site, Application and related systems. Providing consultation and installation services for any new projects or tasks that the Customer requests of Company. Assisting in disaster recovery from backups and maintaining a local file library of all software, licenses, records, or purchases Company has made for Customer, and source code and maintaining a history log or other record for Customer concerning all installations, upgrades, patches, or other Services performed for Customer. Offering general advice and guidance to Customer's employees or end-users, and making recommendations to Customer concerning their systems and software. Liaising with vendors, consultants, engineers, customer support or other third parties or entities related to the maintenance and upkeep of Customer's systems and software. Providing time for consultation with Customer in order to schedule any projects, set priorities, or discuss special needs that Customer may have. Liaising with billing and/or accounting on matters related to payment for third-party software, licenses, Services, or other items unless directly provided by or acquired for Customer by Company. Being available outside normal business hours for questions, troubleshooting or repairs. Fixing errors and omissions contained in any third-party resource outside of the direct control of Company, unless otherwise agreed upon in the specifications. Company agrees to perform the Services pursuant to the specifications set forth in Exhibit B attached hereto (the "Specifications"). This Agreement shall commence on Start Date and shall continue in full force and effect until terminated by either party upon at least ninety (90) days prior written notice. Absent a termination notice, no event (except breach) may terminate this Agreement prior to End Date. Upon termination of this Agreement, Company shall transfer and make available to Customer all property and materials in Company's possession or subject to Company's control that are the rightful property of Customer. Company shall make every reasonable effort to secure all written or descriptive matter that pertains to the Services or Work Product and agrees to provide reasonable cooperation to arrange for the transfer of all property, contracts, agreements, supplies, and other third-party interests, including those not then utilized, and all rights and claims thereto and therein. In the event of loss or destruction of any such material or descriptive matter, Company shall immediately notify Customer of the details of the loss or destruction in writing and provide the necessary information for a loss statement or other documentation to Customer. Customer agrees that additional work beyond the scope of this agreement or the retainer may be negotiated as a separate service and may require an additional agreement or scope of work for services and rates. To secure Company's commitment to perform the services listed above, Customer agrees to pay Company Insert the Retainer Contract Fee as a retainer, billed monthly to be credited against all future services performed. Fees are based on the minimum retainer rate and the actual time spent on services performed, at a rate of Hourly Rate per hour, billed in quarter hour (.25) increments. Travel Rates shall be billed at Hourly Rate per hour and Insert the Travel Mileage Rate per mile. Phone conferences shall be billed at actual time when demanded or scheduled ahead of time by customer. Customer acknowledges that all phone or email time spent working on services for Customer shall be subject to the hourly billing rate. Rates are guaranteed for 60 days from the date of this agreement. Rates may be adjusted after this date without prior approval. All estimates of time to complete a given task are based on Company's evaluation of the task, the extent of Company's involvement and the complexity of the task to be performed. During the course of working for Customer, additional requirements or problems may become evident or additional work may be requested or required. Customer further understands that all estimates are done using the information made available to Company by Customer and that all estimates may be subject to modification at any time. Company shall not exceed the retainer amount without Customer's prior written (including email) or verbal approval. For all of Company's Services under this Agreement, Customer shall compensate Company in cash, on a monthly basis. In the event Customer fails to make any of the payments as agreed, Company will have the right, but is not obligated, to pursue any or all of the following remedies: (1) terminate the Agreement (breach), (2) immediately stop all Services, or (3) bring legal action. Work performed by the Company that is considered "onsite" or at a third-party location may be subject to, but not limited to the agreement and availability of Company for visits; the required number of onsite visits and any agreement, or any other related matters pertaining to work performed at Customer's location or locations. Company reserves the right to refuse travel requests when the work can be legitimately performed offsite. Customer and Company acknowledge and agree that the Specifications and all other documents and information related to the performance, production, creation or any expression of the Services or Work Product are the property of Customer. Materials shared between Company and Customer (the "Confidential Information") including, but not limited to, documentation, product specifications, drawings, pictures, photographs, charts, correspondence, supplier lists, financial reports, analyses and other furnished property shall be the exclusive property of the respective owner (the "Owning Party") and will constitute valuable trade secrets. Both parties shall keep the Confidential Information in confidence and shall not, at any time during or after the term of this Agreement, without prior written consent from the Owning Party, disclose or otherwise make available to anyone, either directly or indirectly, all or any part of the Confidential Information. Excluded from the "Confidential Information" definition is anything that can be seen by the public or has been previously made available by the Owning Party in a public venue. Customer shall indemnify and hold Company harmless from and against any and all claims, judgments, awards, costs, expenses, damages, and liabilities (including reasonable attorney fees) of whatsoever kind and nature that may be asserted, granted, or imposed against Company directly or indirectly arising from or in connection with Customer's marketing or support services of the product or services or the unauthorized representation of the product and services or any breach of this agreement by Customer. Customer warrants that everything it gives Company to incorporate into the Software Project is legally owned or licensed to Customer. Customer agrees to indemnify and hold Company harmless from any and all claims brought by any third party relating to any aspect of the Services Company renders to Customer, or any Web Site, Software or Project Company works with or creates, including, but without limitation, any and all demands, liabilities, losses, costs, and claims, including attorney's fees, arising out of injury caused by Customer's products/services, material supplied by Customer, copyright infringement, and defective products sold via the Software Project. Company is retained as an independent contractor. Company will be fully responsible for payment of Company's own income taxes on all compensation earned under this Agreement. Customer will not withhold or pay any income tax, social security tax, or any other payroll taxes on Company's behalf. Company understands that its personnel will not be entitled to any fringe benefits that Customer provides for Customer's employees generally or to any statutory employment benefits, including without limitation worker's compensation or unemployment insurance. Company agrees to adhere to all of Customer's policies and procedures concerning code and conduct while on Customer's premises. Customer agrees to make available to Company prior to the commencement of this Agreement all manuals, codes, rules, and regulations that Customer requires Customer's staff or employees to read and/or sign. Company shall maintain throughout the entire term of this Agreement, adequate general liability insurance providing coverage against liability for bodily injury, death, and property damage that may arise out of or be based upon any act or omission of Company or any of its employees, agents, or subcontractors under this Agreement. Upon written request, Company shall provide certificates from its insurers indicating the amount of insurance coverage, the nature of such coverage, and the expiration date of each applicable policy. Company shall not name Customer as an additional insured on any applicable policy at any time during this Agreement, or as a condition of acceptance of this Agreement. Company will not be reimbursed for any expenses incurred in connection with the Services or Work Product, whether direct or indirect, without the express written approval of Customer. Rules governing expenses for work that is performed by Company that is considered onsite shall be defined in Exhibit A. Company shall have no right to assign, sell, modify, or otherwise alter this Agreement, except upon the express written advance approval of Customer, which consent can be withheld for any reason. Customer may freely assign Customer's rights and obligations under this Agreement. In the event Customer fails to make any of the payments set forth on Exhibit A within the time prescribed in Exhibit A, Company shall have the right to withhold Services, remove Work Product from Company-owned resources, or seek legal remedy until payment is made in full, plus accrued late charges of 1 1/2% per month. Customer warrants that everything Customer gives Company in the execution or performance of Services, or the creation of any and all Work Product is legally owned or licensed to Customer. Customer agrees to indemnify and hold Company harmless from any and all claims brought by any third party relating to any aspect of the Services or Work Product, including, but without limitation, any and all demands, liabilities, losses, costs, and claims including attorney's fees arising out of injury caused by Customer's products/services, material supplied by Customer, or copyright infringement. Customer grants Company the right to use descriptive text, testimonials, performance metrics, and other images, photos, and/or graphics that demonstrate the Services or Work Product for promotional purposes, and/or to cross-link such items with other promotional resources developed by Company. Company shall have no responsibility for any third party taking all or any part of the Services or Work Product, results of Services or Work Product, or the improper use by any third party of any Services or Work Product produced by Company. Company shall have the exclusive rights in making any derivative works of any Services, methodology, or Work Product. Company is not responsible for any down time, lost files, equipment failures, acts of nature, or any damage resultant from activities considered beyond the control of Company, such as war, riots, natural disasters, vandalism, and other events. The parties represent and warrant that, on the date first written above, they are authorized to enter into this Agreement in its entirety, and duly bind their respective principals by their signatures below. 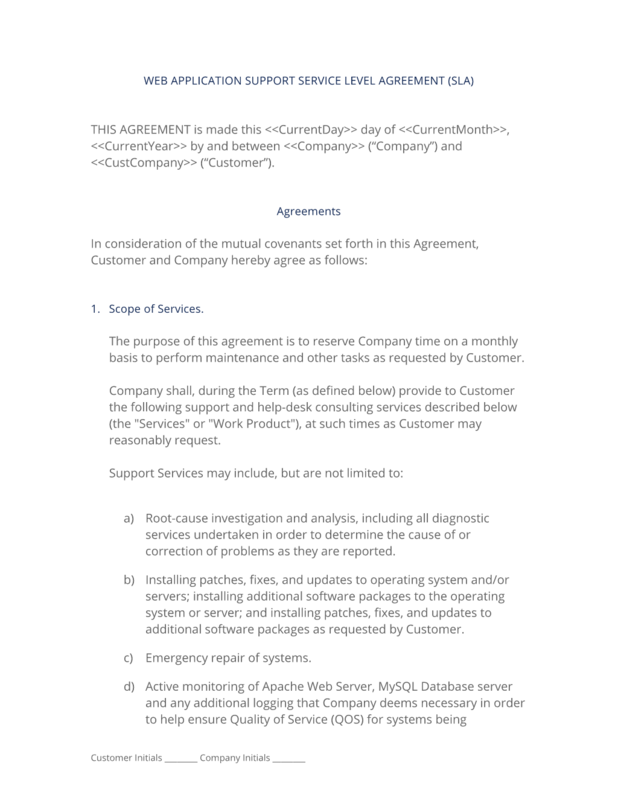 The complete Web Application Support Services Contract - with the actual formatting and layout - is available in this Contract Pack.